Mariners Latest: Should the Mariners Pursue Josh Hamilton? 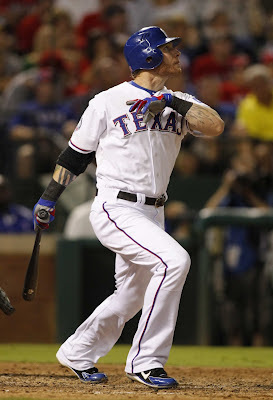 Should the Mariners Pursue Josh Hamilton? Two things before we get in to the whole thing about Josh Hamilton and the pursuit of said player. Notice at the top I didn't ask if the Mariners WILL pursue, but whether or not they should. I'll grant you that Hamilton is a fantastic player and most, if not all, might think I'm crazy for even considering whether they should or not. I can almost hear it now. "Have you lost your mind?! Of course they should!" As long as you don't bring the gentlemen in the white coats to my door, by all means, continue. It's not as simple as saying "It's Josh Hamilton, he's great, pay him and put him in the lineup." Obviously it's not quite that simple, but I'm wondering if it'd be worth signing him for more than one year. Again, you may think I've lost whatever semblance of a mind I had to begin with, and that's your right, but when it comes to getting a big bat out of free agency, rationality has to have a place also. The Mariners need a bat. Preferably a veteran bat that can actually hit one over the fence every once in a while. The way free agency is looking thus far, there's going to be a pretty big drop after guys like Hamilton and David Ortiz. I want the Mariners to go after a veteran power hitter this offseason also, but would Hamilton be the right fit for the contract he'll probably want? Hopefully, we'll at least have a better understanding of what we're looking at with Hamilton. As I'm sure everyone is aware, Josh Hamilton is set to become a free agent at the end of the year. His final at bat this year was met with plenty of boos by the end of it. At the end of the game, it was fairly clear he was not very happy with the way the fans took out their frustration on him. He struck out in a critical situation and just a couple of days before, he flat missed a fly ball that allowed the Athletics to pull ahead in the final game of the season. Fans were frustrated and all signs point to him being done in Texas. What this means for Seattle is that there may be another free agent on the market this winter that could give them a huge boost offensively. But should they sign him? There are pros and cons to every free agent signing, one of them being the player could arrive and become a big huge pile of crap. Isn't that right Chone Figgins? Sitting here on the computer with no real idea of what Hamilton or his agent are thinking, I'm willing to bet something in the range of 3/$60m to 3/$75m is what he'll end up signing for. With the Mariners payroll at $79.5 million this year, which includes buyouts and no options exercised (per Baseball Reference), they may have some wiggle room if they bring their payroll back to where it was in years past. So payroll flexibility would be a good idea, and let's assume the Mariners have it. They may decide to keep the payroll around $80-85 million next year, in which case this would be a moot point, but for the sake of argument let's assume the organization is willing to up their spending for next season. As a player, Josh Hamilton is a monster. That's never been the question. The question for us as fans is what can we expect from Hamilton if the Mariners sign him? That's actually not a fair question, since predicting a season is about as close to impossible as you can get without actually touching it. What we can do from our warm cozy homes is look at his numbers for seasons past and see what we can see. We can also look at pictures and diagrams and other wonderful technological stuff that looks pretty and tells a story. 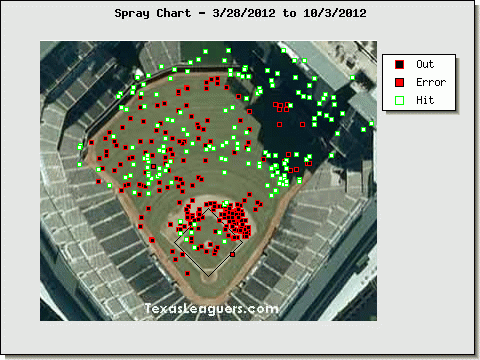 For the latter point, we turn to texasleaguers.com's Pitch F/X tool. The dimensions for the Ballpark at Arlington are as follows: Left Field: 332 feet, Left-Center Field: 390 feet, Center Field: 400 feet, Right-Center Field: 381 feet, Right Field: 325 feet. Beginning next year, the Safeco Field dimensions will be as follows: Left Field: 331 feet, Left-Center Field: 378 feet, Center Field: 401 feet, Right-Center Field: 381 feet, Right Field: 326 feet. As you can see from the dimensions, they'll be very similar save for the left center power alley. Safeco is a notorious pitcher's park partly due to the dimensions, but it's also right off the water. Hamilton may lose around 5+ home runs a year playing in Safeco, but looking at the chart above, hitting for about the same power won't be an issue. The biggest concern regarding the signing of Josh Hamilton is his age and his past drug use. I'm not saying he'd be a bad influence or anything of the sort. What I'm saying is, that sort of stuffwreaks havoc on the body and for a ballplayer, it's magnified because of the wear and tear 162 games takes on a body. Josh Hamilton will turn 32 next May. He's not at the end of his career yet, but nobody, including Hamilton himself, knows what kind of toll his body has taken because of past events and the last 6 years of baseball. We may not know about his future health, but past health has been a bit of an issue for him. From 2007 to 2012, he's played in 90, 156, 89, 133, 121 and 148 games. He's average roughly 123 games a year since he got back in to baseball, missing 39 games on average. Next, we're going to take a look at the FanGraphs Plate Discipline tables for Josh Hamilton. As a quick refresher, SwStr% is the overall percentage of pitches a batter swings at and misses, O-Contact% is the overall percentage of pitches outside the zone a batter makes contact, Z-Contact% is the overall percentage of pitches inside the zone a batter makes contact, Contact% is the percentage of contact overall when swinging the bat. Now that you have that memorized, let's take a look at what he's done in the past. I tried to keep it simple as far as the numbers and chart goes, but I didn't want to make anybody's head explode like mine is about to. Looking at the numbers, I'm a little concerned. Not massively, but there's evidence his performance slipped in 2012. He swung at few pitches outside the zone, but the same can be said for pitches inside the zone. Overall then, he wasn't swinging as much as he used to. Whether that's attributable to just not seeing very many pitches he can do anything with, a nagging injury or something else entirely isn't completely clear. Even so, when he did swing the bat, he swung and missed at a much higher clip than he had in the past. Taking all of this into consideration and what a contract like his might look like, I'm not convinced a contract more than one or two years would be a good idea. I get that Hamilton's been an incredible player and will probably continue to produce reasonably well, I think he's already started on the down side of his career. Would it be worth a look to sign him to a one year contract with an option for a second? Absolutely. Two years, I can get behind that. Three years and I'm not sure I'd be comfortable giving him that many guaranteed years with his past injuries and his current trend at the plate. This is just taking past performances and making a guess as to what the future might hold. I'm not saying the Mariners would be stupid to sign him for three years or that he'll completely implode and be about as productive as a watermelon at the plate. I'm saying if the Mariners don't pursue him, there's a reason for it. If they do and it's for a year, it's for a reason. I'm just as guilty of screaming bloody murder when they don't sign a guy because of the name on the back of the jersey, but the name isn't everything. Do I think they should pursue him? Yes, without a doubt they should try to sign him, but not at the expense of overpaying for what might end up being a pretty good player in future years and not a great one.